But the limit expression gets on the side of the lim symbol. I want it to be under lim. 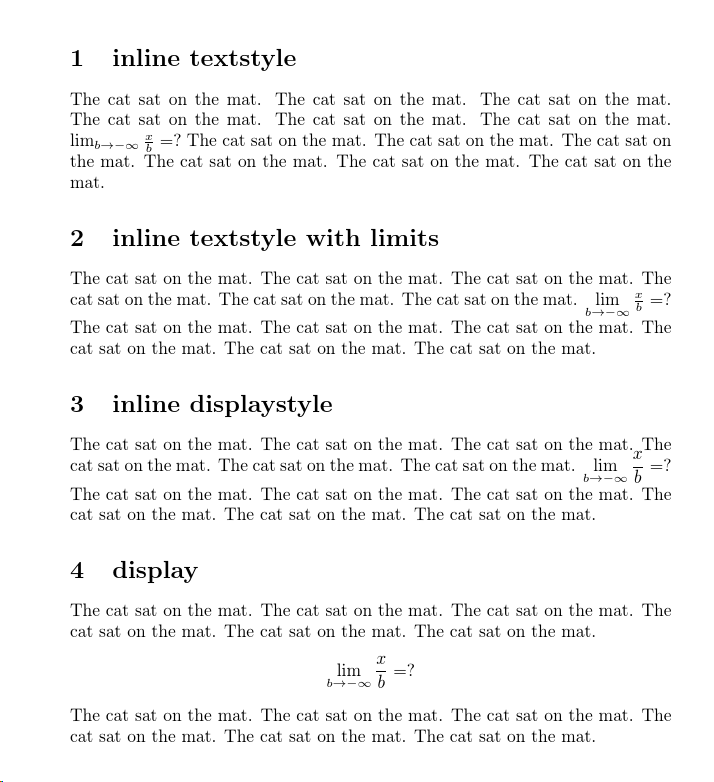 I see that in some LaTeX represented versions, it appears in a correct way. The textstyle layout is designed not to disturb the interline spacing in the surrounding paragraph. If you force the use of limits style on math operators, or worse, force the use of displaystyle for the whole inline expression, the line spacing is disturbed and it is hard to see the paragraph as a unit of text. If the expression is complicated enough to require this, it is better to set it using a display construct such as \[\] rather than inline. The cat sat on the mat. The cat sat on the mat. The cat sat on the mat. How to draw text-anchored tikz line below text instead of above? Why is my prime symbol too low? And: Why are my subscripts not scaled accordingly when I use \scriptsize?